Delivery bright red button computer keyboard with car. Check Out Our New Vehicle! In our efforts to provide the most valuable service to our clients, and deliver products in a timely and efficient manner, Pro Stainless has upgraded our vehicle fleet. 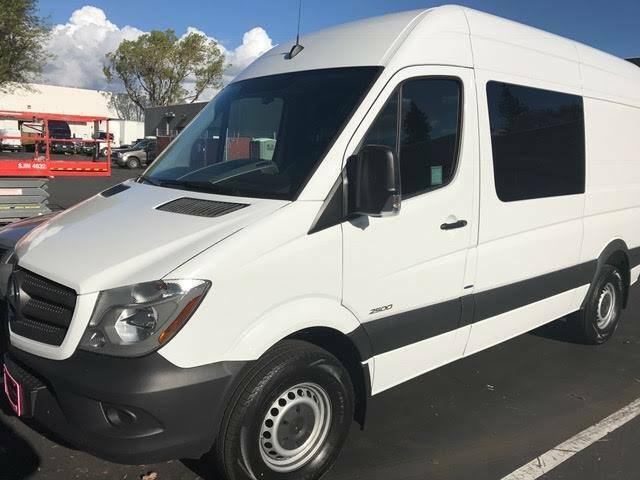 We are quite fond of our new 2017 Mercedes Sprinter, not only for its reliability, but also for the generous space it affords us to deliver Kits, Just in Time inventory, and plenty of fasteners. In the wake of the series of storms we have been experiencing, we wanted to include a large van that will further insure our products stay dry and out of the weather. Our customers are our top priority. Modernizing our vehicle is an important step in making sure that our customers receive their products, despite any inclement weather which comes our way. Our new vehicle is one more tool we can use to ensure our service doesn’t miss a beat. The height and depth of the Mercedes Sprinter will allow us to deliver just about anything. Besides being in a dry environment, we can also secure the vehicle and its cargo while making deliveries. So far, reaction has been positive from both customers and our drivers. This is a win-win situation for everyone, and another way Pro Stainless goes about putting our customers’ needs first. Pro Stainless is proud to be one of the leading fastener distributors in San Jose and the Bay Area. We continue to make modifications to the way we do business to provide a better, faster, more effective solution to our customers’ needs. Pro Stainless is a leading industrial fastener supplier with over 18,000 line items stocked. During the 36 years we have been in business, we have worked with clients to provide additional related services that go beyond what typical fastener distribution offers. We have developed a Kitting program and a Just In Time stocking program which provide additional benefits and cost savings to our customers.